Every Tuesday, Castle Glower changes. Sometimes a new room, a staircase, or a hidden passage, and Princess Celie’s out to map them all. When her parents and eldest brother disappear during that brother’s graduation, it’s up to Celie, Rolf, and Liliah- and, of course, Castle Glower- to protect their land and their people from those within and without who would try to claim power. The bad guys? They’ll never know what hit them. I love Jessica Day George. I love her Middle Grade adventures, I love her teen fairy tales, I love her books, so when I heard about this one coming out, I was ridiculously excited. Do you have any idea how happy I am when that excitement is merited? It’s adorable and sweet and heart-wrenching and pulse-pounding and bold and just utterly amazing. I couldn’t put it down, and when I got to the end, I really wanted nothing more than to turn back to the beginning and start again. Celie is an amazing character. She’s the youngest of the Glower children, bright and inquisitive and endlessly resourceful. She has a hunch that the semi-sentient castle is fond of her, and certainly the rest of her family thinks so as well, and she’s dedicated herself to creating an atlas of all the changes, expansions, and acquisitions that the castle has given itself during her lifetime. Wherever she goes, she’s bound to have her notebook and colored pencils there to properly document the course of things. She knows the hiding places, the shortcuts, and when the castle tries to tell her something, she knows to listen. What I love most about Celie is how well-developed she is across such a broad range. She can be relentlessly, reckless brave, but she’s also scared, a little girl who’s parents and brother are missing, someone who’s threatened and vulnerable and determined to stand strong in the face of it. She’s loyal and appealing, bone sweet with a bit of a mean streak (totally justified, but wonderfully vindictive), and more than anything she throws herself fully into life. Just as much as Celie, Castle Glower is a character, strong and defined in its own right. It’s compassionate and brave, protective of those it calls its own, and a staunch defender it what it feels is right. It knows the needs of its people better than anyone else can- and chooses its own kings. Rolf, the current heir, isn’t the oldest child or even the oldest son, but he’s the castle’s choice. They found that out when the castle moved his bedroom closer to the throne room. If the castle doesn’t like someone, their rooms get smaller and smaller, farther and farther away, while those the castle does like have spacious, comfortable rooms convenient to a life at court. Seriously? I want to live in Castle Glower. I can’t imagine anyone who wouldn’t. A place like that with endless possibilities and limitless opportunities for exploration? It’s countless childhood dreams come true. The nine-year-old me that cried when I realized I’d mapped the entire neighborhood (including the poison ivy laced woods I wasn’t supposed to go into) was drooling over the descriptions of the castle. The cast is gorgeously drawn, rich and varied. The villains are appropriately sinister, but also just a bit comical. You never know quite who to trust, as mysteries and betrayals abound, but there are some who can always be counted upon- for example, the siblings can always count on each other. There are distinct cultures, even dialects, which can be funny in the occasional misunderstandings but also lend a sense of menace. As king’s heir, fourteen-year-old Rolf is a beautiful blend of responsibility and mischeif, proof that the Crown Prince can still be a prize fool when the mood takes him. His swings through anger and petulance and vindictiveness are completely believable, but they balance against the more prevalent aspects of his personality, like his humor and his hope, his protectiveness of his sisters and his willingness to indulge (mostly) older sister Lilah’s need to mother them when she’s stressed. He hasn’t lost himself in the gravity of his position, and he’s willing to take big risks for worthwhile results. Consistently through the story, he’s Celie’s older brother, even when circumstances are forcing him to be so much more. Lilah, the older sister and beauty of the family, has a tendency to overmother things (especially when she’s stressed) but she’s also a vivacious flirt, one who doesn’t feel obliged to look purely at social status when making such decisions. She’s responsible and ladylike (proper, would be the term that comes to mind) but though she has very real fears and hesitations about some of the ventures, she finds the courage to do them anyway. Because they’re important, because they’re necessary. Because they’re what needs to be done. And her sometimes-suitor Pogue is charming, flirtatious, and bone-deep loyal. I really liked Pogue, and he was ample proof that the title of nobility isn’t required for the existence of the virtue. There is so much more I could say about this book, so much I want to say about this book, but I’m not going to. I don’t want to take away any of the delightful discoveries Castle Glower has in store for you. 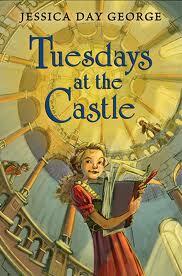 Tuesdays at the Castle by Jessica Day George, available now in both hardcover and e-format. I love it to pieces too, as did my son! I want more Castle please!